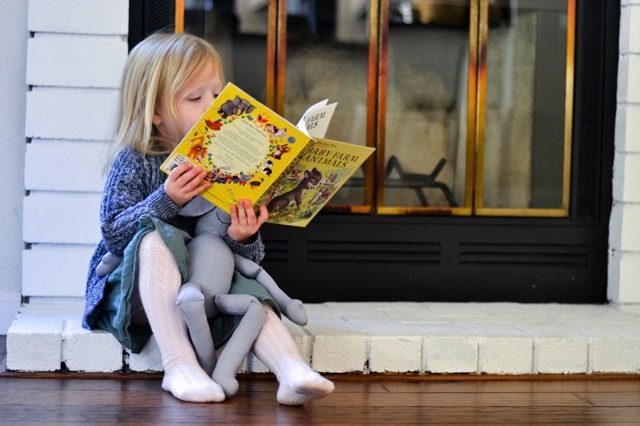 A lot of us feel overwhelmed with children’s stuff at the holidays. At the same time, we are also mortified at the idea of being ungrateful for gifts so lovingly purchased for our children! I really think we may be one of the first generations to ever have this problem! 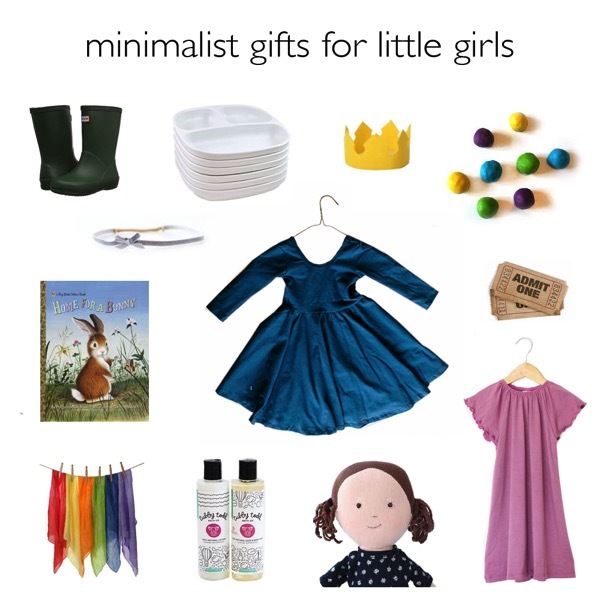 So what is a conscious minimalist to do with people who really want to buy your little girl something to unwrap? In most cases, we graciously receive whatever we are given because relationships are more important than things. But if they ask? Well, it sure does not hurt to have some ideas in your back pocket! I didn’t list any big items on here because most of us do not have the space for those. I have a hard time finding space now; all the more so when we lived in 900 square feet! At the same time, I also didn’t mention toys with a lot of small pieces. Most of them are manufactured or handmade in the U.S. Hopefully some of these ideas will get your inspiration going! 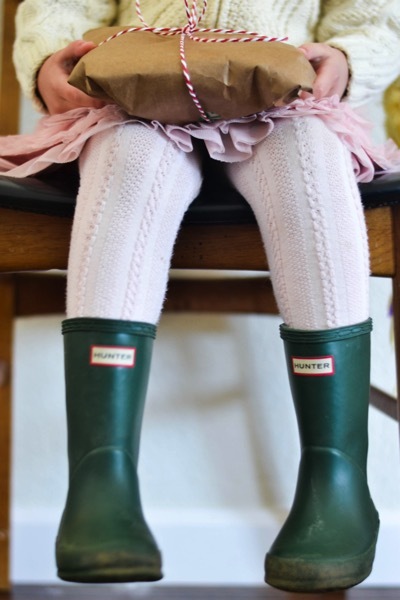 They can put these on by themselves and go outside to play with the best toys…sticks and rocks. We have the green Hunter ones which can be passed on to any gender or re-sold (though I found later that they are manufactured in China). These Kamik boots are made in the U.S. and can be done last-minute with Zappos two-day shipping. I got my girls these white Replay dish sets when I was sick of them fighting over the colors (and princesses) on our children’s plates and cups. You could get a full set at once or people could buy them in pieces. 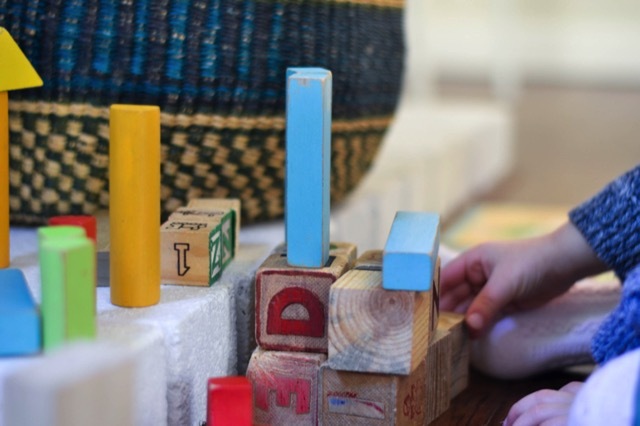 Cloth and wooden toys are not just for idealists. 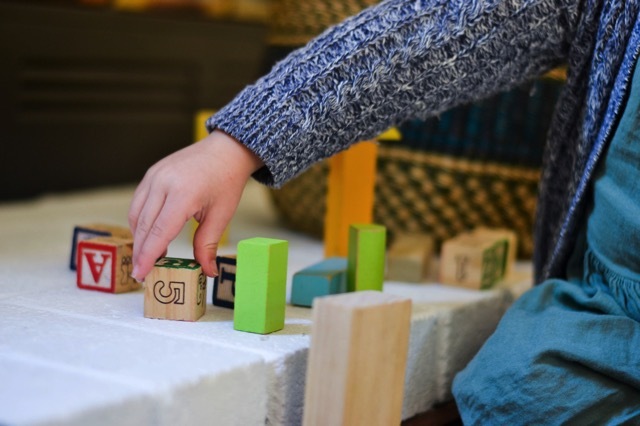 Low-tech, open-ended toys encourage creativity and problem-solving during play. They also don’t tend to break in the same way that plastics do. For example, I bought my girls felt crowns for the dress-up box because they were constantly breaking their plastic Disney ones. Etsy is awesome for this. You can get everything from wooden teethers to crocheted play food. 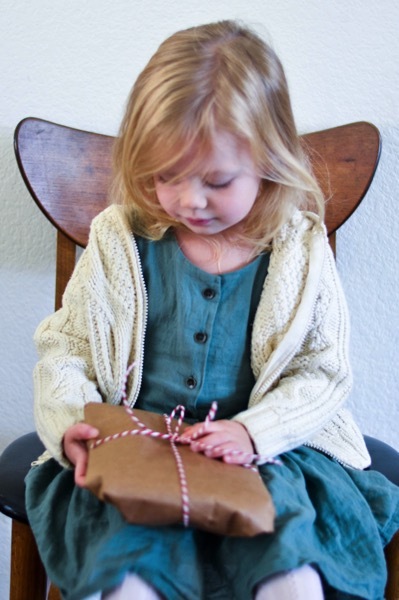 Handmade does not have to mean “junk gift,” nor does it have to require actual craftmanship. I mean, how awesome and inexpensive would little jars of spiced, homemade play dough be? Or how about the Rapunzel braids that I made my girls two hours before Halloween…braided yarn and ribbon, guys. They are literally living in them. Check out my Pinterest Play board…cute gift ideas for years. We are pretty minimal with our clothing, so I like to have a good collection of hair bows around. 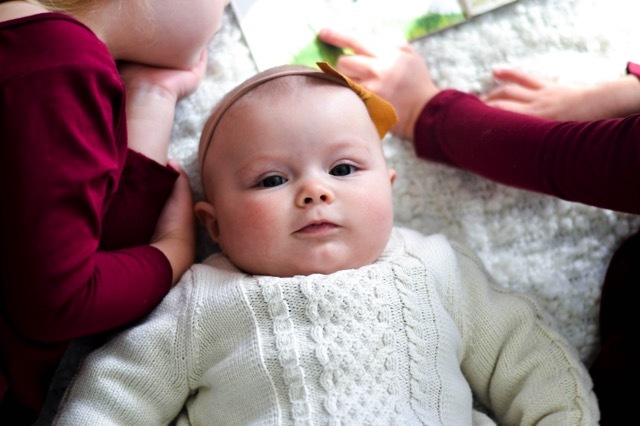 (Plus, ahem, my babies are bald…see above.) Etsy is hair bow central these days! Little Crane is one of my favorite hair bow makers. 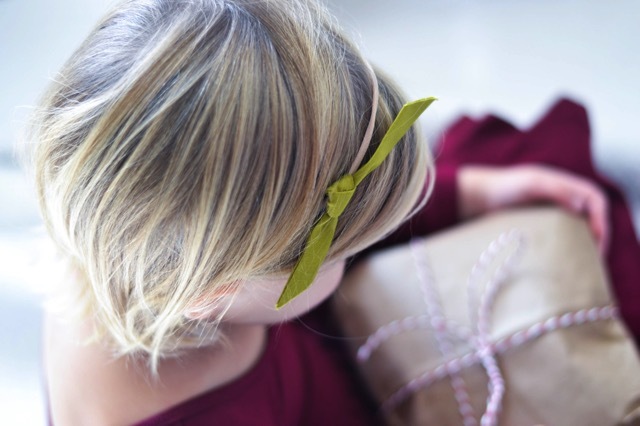 The bows are made of grosgrain ribbon and velvet in a wide variety of muted tones. The bands are made of a soft, stretchy fabric that will fit from newborn to toddler. My sister loves June and January headwraps for her little girl. One of my friends mentioned the idea of gifts that could be added to existing collections. I like to add to the Duplo collection every year. These were designed by a mom who wanted to make a feminine dress that both she and her little girls would love. Well, she nailed it. As a mother of young kids, it’s really nice to have an excuse to leave the house for the morning (not to the grocery store) and wear the kids out for a good nap. A simple day pass to an aquarium or zoo might not be a big deal to unwrap, but I promise it will be appreciated and enjoyed. Art supplies are always in use at our house. 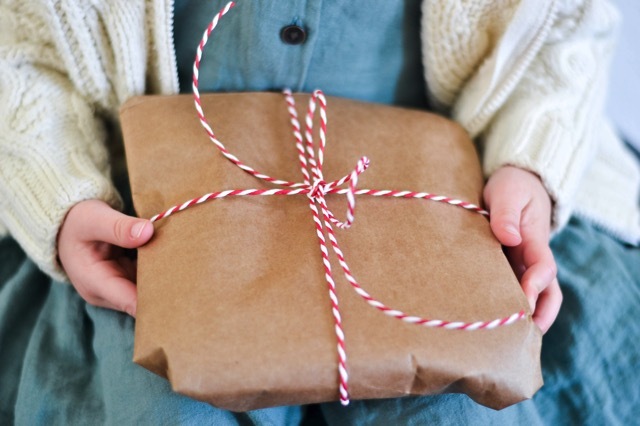 Washi tape, construction paper, fresh packages of crayons, pads of paper and play dough are always in high demand. Sidewalk chalk and bubbles are also a hot commodity. I love the idea of some special bubble bath and lotions from Tubby Todd or Honest Company! Talk about something we use every day! My girls want to dress their dolls but are not old enough to dress rigid Barbies or fashion dolls without getting frustrated and needing help. I got them each one of these Hazel Village Dolls and a dress. The U.S. based company works with a fair-labor factory in India. We need these every year and they get so much wear. Instead of several different pairs, we have a gown from from Plain Jane and winter pajamas from City Threads. All this being said, we own plenty of toys that aren’t things I particularly want in our space on a regular basis, but that were purchased for us very thoughtfully and lovingly from relatives. In this case, a toy library is the solution. We keep them in the garage and get them out on special occasions or when that person visits. Other times, I will take the toy or clothing before it can be missed and put it away to be sold on consignment later in the year. Then I save the cash for something like play silks. Because it’s okay, really. Small children don’t know that Christmas has to involve a lot of toys. If your little ones are easily overwhelmed by too much stuff, (you will be able to tell in their behavior) it is not controlling or stealing a child’s joy to set limits. Some parents like to show love by being extravagant with gift-giving once a year at Christmas, which I think is perfectly good. Or they like to do one big gift! I like this idea for later. At this developmental stage, I err on the side of minimal and low-stimulation. On this note of giving, a lot of my friends have also asked me what we do about buying gifts for extended family, since many people expect aunts and uncles to get their kids gifts. For us this is just too much time, expense and decision-making. I have six siblings on my side of the family! For some people gift buying for each person in their extended family is fun. For me it is stressful. We made a concession for the sake of relational peace by doing a family gift. In past years we have done things like board games, movie tickets and iTunes cards. I’ve settled on the idea that I like being the aunt who buys family movie tickets every year (I get Fandango cards). Going to the movies on Christmas Day or Christmas break when all the best films are in the theaters is a fun tradition. I usually package it up with a gift card for eating out or buying movie snacks at someplace like Trader Joe’s. Isn’t it great to know that kids don’t need much to be happy? 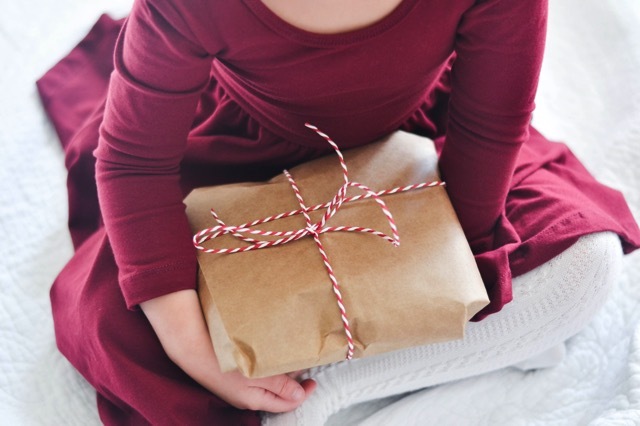 Wishing you a simple and joyous gifting season from our house to yours!